Hey Babe, whats your sign? 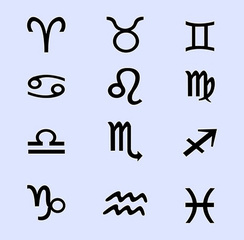 It’s a new year and the Zodiac signs have changed! Good thing it applies only to those born after 2009, I don’t know that I want to be a Sagittarius, but then again, that new sign Ophiuchus does sound kind of cool! ”In science we deal with a long tradition of fact based investigation. We are not in the business of interpreting the purported relation between the positions of planets and human affairs. “The Earth spins and, like a toy top, the spin axis moves around, pointing in different directions. Today, Earth’s spin axis points toward the pole star, Polaris. Around 3000 BC Earth’s spin axis pointed toward Thuban. Wait 26,000 years and the north star will again be Thuban. Astronomers call this motion of the spin axis precession. About 130 BC, Hipparchus noticed that the Earth’s spin axis had changed directions, so astronomers and astrologers have known about the Earth’s precession for over 2000 years. This entry was posted in Opinions and tagged zodiological sign changes. Bookmark the permalink.